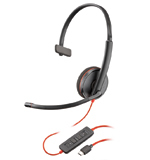 The Plantronics Blackwire 3210 (mono) USB-C UC headsets that are durable, comfortable, easy to deploy and come in a variety of connectivity and wearing options. Add insights from Plantronics Manager Pro, an additional Software-as-a-Service offering, and you've got a future-proof solution. Blackwire 3200 Series with Plantronics signature audio provides top notch features at a price you can afford. * Built for UC applications and softphones from Avaya®, Cisco®, Microsoft® and more*.